I know it has been a long time since I posted but I have been very busy. I've been busy making Christmas Cards and creating items for a DT. Yes, that is my exciting news, I have been accepted to the Creative Inspiration DT and am so looking forward to working with them. Since I start the 1st of January I have been getting some work done ahead of time and getting it ready to be able to post it. 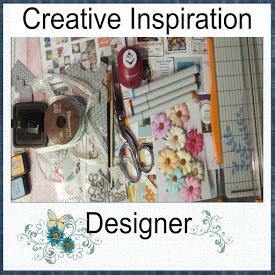 I have been a member of Creative Inspiration for some time now and I love the group and to be a member of the DT is very exciting for me. The DT there is very good so I am going to have to be on my toes to keep up with them. With Christmas just around the corner, I have also been busy getting ready for the holiday. It is an exciting time to be celebrating our Saviours birth. To know that he came into this world as human baby, knowing that he was going to die on the cross just to take our sins upon himself so that we could be saved and go to heaven instead of going to hell. To know that someone loved us that much, is mind boggling. To know that some people would rather go to hell than to believe on the Lord Jesus Christ is also mind boggling. I am praying that at this Christmas Season, people will see and understand the true meaning of the season and will ask for his forgiveness and invite him into their lives to live with them and give them the love, peace and hope that they are searching for. Have a wonderful blessed Christmas everyone. Stay safe. Yay Jackie! So excited for you! Congrats and Merry Christmas!